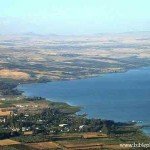 The Sea of Gallilee is a beautiful fresh water lake that is fed from rain runoff from the mountains of Gallilee and the Golan Heights. It is 695 feet below sea level and is five miles wide and thirteen miles long. The lake is only 150 feet deep at the deepest point and is really a lake more than a sea. However, it is the main water source for all of Israel. It is filled by the Jordan River, which has it’s beginnings on Mt. Hermon, an often snow capped peak at the north end of the land of Israel. The Jordan then flows out of the Sea of Gallilee, down to Dead Sea. The Dead Sea is much larger than it’s northern counterpart. It is forty eight miles long and eleven miles wide and reaches a depth of over 1000 feet. It is the lowest place on the face of the earth at 1300 feet below sea level. 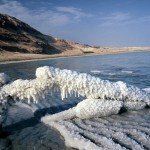 The Dead Sea is dead because it is so salty. Twenty five percent of the water’s contents are salts. The water is clean and beautiful looking, yet it is bitter and nauseuous to the taste. The salts in the Dead Sea are worth billions of dollars and are as valuable as any oil field. The Dead Sea is so salty because it has no outlet. The reason the Sea of Gallilee is so sweet, is that it has both an inflow and an outflow. It both receives and gives. The Dead Sea, however, only receives and never gives. It is full of riches but there is no life in it. The difference between the two lakes make for a very good spiritual life lesson. The desert continues to speak!! As I was listening to a message recently by Dr. Dobson from Focus on the Family, I was really impressed by his message that our faith must be tough. I was reminded that though life is seldom easy, God wants his people to be fighters, to hang in and be tough when the problems come. Somehow, we have gotten the idea in America that we are entitled to 75 years of easy life, with plenty of material gains and few problems and stress. We have huge over-expectations of the “good life”, and when our real circumstances don’t match up to our lofty expectations, we are depressed and discouraged. We want to bail out and go somewhere else. We Americans (and I speak for myself) are soft. We are not used to hardships and we don’t know how to hang in there when adversity strikes. This seems to be especially true in our marriages. Americans are bailing out of their marriages at an alarming rate. In Numbers Ch. 11, God was angry when his people began to complain because of their circumstances. The Hebrew word that we translate complains is “kvetch” and is a shaking of the fist at God and griping and whining. God had provided for everything they needed in a harsh environment, yet they were not satisfied for even three days. Because of this “kvetching”, God anger burned against them. When we complain, we are saying to God that we don’t trust Him; we don’t think that he will provide and sustain us in hard times. We need to accept the fact that we are going to go through hard times. Jesus told us this in John 16:33 when he said,” in this world you will have trouble”. All of the heroes of the faith listed in Hebrews Ch. 11 were listed there because of their endurance and perseverance in time of testing and trouble. Paul said it best in Phillipians 4:11-13 about what our frame of mind should be. Notice Paul says, I have “learned” to be content. It wasn’t something that he was born with or got when he was saved. He had to “learn” to be content. By going through all the ups and downs of his life, and he had plenty, he learned that he could do all things through Christ who strengthened him. A lot of people quote that verse, but when you read it in context, it is talking about overcoming the adversities of life. God wants and expects me to be “tough” in my approach to the circumstances of life. When life throws you a curve, and it will, we must react with perseverance (Rom 5:3-4). Suffering produces perseverance and perseverance produces character. Hebrews 12:1-3 says, “Let us run with perseverance the race set before us….. So we won’t grow weary and lose heart”. These scriptures are especially pertinent for marriage and family situations and the problems associated with older age. Count on the fact that you will experience trials and tribulations and plan on hanging tough for the long haul. The Christian life is not for sissies! We don’t get to move to Hawaii when we get saved! We are going to have to tough it out here in the desert of this life. So be strong and courageous and hang on to him! The story of Abraham and Lot separating is a great story that contrasts the life of two men who had choices to make. Abraham made the right choices, while Lot made the wrong ones. Lot was deceived by appearances and it cost him dearly. Lot was Abraham’s nephew, and Abraham invited Lot to follow him and help him. While Lot was with Abraham and served Abraham’s God, he became rich in possessions (see vs. 5&6). When problems arose, Lot and Abraham were forced to make some choices. 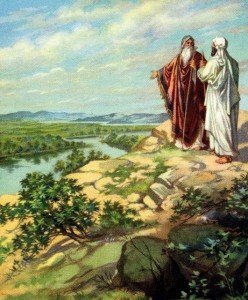 Abraham, always generous and the peace maker, gave Lot the opportunity to choose the land he wanted. Abraham knew he could not obtain wealth except by the Lord’s blessing anyway, so he let Lot have the choice (Gen. 14:22-24). Lot got greedy, and in his greed, he chose what appeared to be the best land for himself. However, he knew by moving next to Sodom, he was leaving the God of Abraham and it’s blessings and security. He sacrificed spiritual health for material possessions. On the surface it seemed as though he had made a good decision. He got the best looking land, the plains along the Jordan River. The land looked green and fertile. Also, he gained position as a leader among the idolatrous people of Sodom, because the Bible tells us that he “sat in the gate” at Sodom which meant he was a judge and one of their important people (Gen. 19:1). When Lot left Abraham, he not only left the wilderness, where a person had to depend upon God for survival, but he also left Abraham’s God. This spelled disaster for Lot and his family. Lot lost everything dear to him, his possessions and his wife, and then found out that his daughters had become like the incestuous people of Sodom (Gen. 19:30-38). His grandchildren became the Moabites and Ammonites, who were infamous for their idolatry and evil ways. They were bitter enemies of God’s people from this time forward. Lot’s bad choices spawned generations of wicked results. How does Lot’s situation apply to us? Satan paints a wonderful picture of the outside of our culture. It looks desirable and healthy and “everyone is doing it”. It is so easy to get caught up in the desire for wealth, material possessions and sexual attractions that look so great on the outside. We are constantly tempted to make the wrong choices. Satan can’t wait to draw you in behind the curtain. Once he gets you hooked, then you realize how sickening your choices were. Abraham refused to compromise and continued to count on God for all his needs. He made all his choices according to God’s standards. Read Gen. 13:14-18 again. God blessed Abraham tremendously for his obedience. Don’t be deceived by appearances! !